Fort Bragg California as one of just six communities to earn “Gateway Community to the California Coastal National Monument” status. 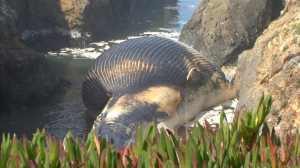 On Monday, October 19, 2009, a female Blue Whale washed up on the Mendocino Coast. She was 73 feet long and weighed approximately 70 tons. She ran into the propeller of the research vessel Pacific Star in the open sea. Shot by Terrence Vaughn, Allen Droyan and Samuel Thompson. In Celebration of The Mendocino Coast 30th Annual Whale Festival. Assagiare Mendocino won the professional tasters award and Harvest Market won the peoples choice. Caito Fisheries donated 30 pounds of crab per chef and they stepped up to deliver. Wineries poured their specialties and the crowd was better than ever. Fort Bragg Skate Park was held to a throng of enthusiastic skaters. Jennifer Owens phenomenal grant writing skills and a committed Fort Bragg City Council. We Love Soaps is proud to announce Sundays The Series Wins! for the 3rd Annual Indie Soap Awards. What a great job Mendocino TV did presenting this “special” about the California Coastal National Monument. Thank You!! Rock Star Ruth Sparks and all those who love the rocks of our Coast! !